Canadian astronaut Robert Thirsk was a crew member of the 20th mission to the International Space Station in 2009. Between then and an earlier flight in space, he earned an MBA from MIT’s Sloan School of Management. It’s the Kennedy-era space race. Heroic test pilots are blasting into orbit, and into the dreams of countless children, including one bright Grade 3 student on Canada’s West Coast. He wants to become an astronaut, too, one day, and it’s easy to imagine him gazing more than once at the sky through his classroom windows. These are, after all, the heady days of Alan Shepard and John Glenn, U.S.'s Project Mercury and the Soviets’ competing Vostok program. It’s a reminder that the out-of-this-world ambitions of young children should never be discounted, but encouraged, as Dr. Thirsk’s Grade 3 teacher and other teachers and professors motivated him throughout his life, even pushing him mid-career as he added an MBA to his list of credentials, which included degrees in mechanical engineering and a medical degree, to say nothing of his many years of astronaut training. Yet, studying for an MBA, he said, “was the best learning experience of my life,” which may seem surprising. Business school came between his Space Shuttle mission in 1996 and his 2009 endurance test aboard the space station, which lasted 188 days. But before that second mission, before it even became a possibility, Dr. Thirsk wondered what was next in store. He had spent a lifetime pursuing his dream. Now what? He went to his boss at the Canadian Space Agency, William (Mac) Evans, who asked Dr. Thirsk to become director of the Canadian astronaut program. There’s an obvious pattern here, and he still firmly champions education, using himself as an example. "I’m one of those people who don’t think that management is just common sense and intuition. I think there are some skills and frameworks and mindsets to acquire,” he says of his MBA. He enrolled in the kind of program geared toward the highly qualified, the one-year, full-time Sloan Fellows program at the Cambridge, Mass.-based MIT, one of the oldest business programs for mid-career professionals. The curriculum covers the same bases as a regular MBA, “but I’m not exaggerating when I say that in a typical lecture, the students did half the talking. The lecturer would present the material, then those of us in our mid-career, we already had war stories to share in class, to bring home the point that the lecturer was trying to make," he noted. “Certainly, I shared a lot of my stories." And it wasn’t a cakewalk. “It pushed me, it exhausted me. It also satisfyingly took me to my limits,” he said. Again, this may sound surprising coming from someone who has experienced so much exhaustive learning, such as capsule-recovery exercises in the Black Sea. He and fellow astronauts-in-training had to strip from their space suits inside their tiny capsule (like three men in a phone booth, he says) and put on water-survival gear, only to have their first attempt aborted because their body temperatures had begun to soar. “If this had been our actual landing day, my crew mates and I would have died from hyperthermia inside the capsule or hypothermia in the ocean," he writes in his online blog. “Space exploration is no-kidding difficult,” he adds. The crew members pored over the details of what went wrong. They succeeded the second time. 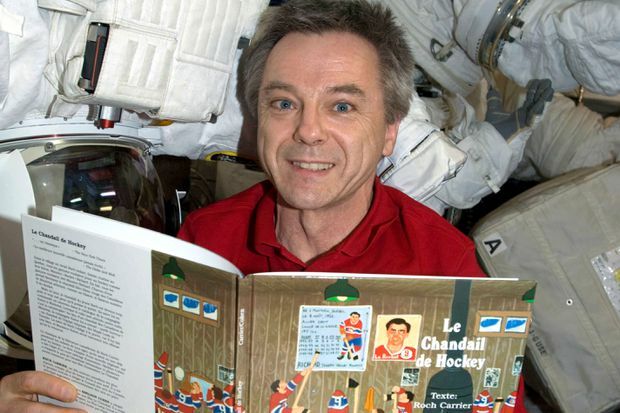 Aboard the International Space Station in 2009, Canadian astronaut Robert Thirsk takes a break from his scientific work to read the French and English versions of The Hockey Sweater. When talking about this dream-to-reality experience over the phone, however, Dr. Thirsk didn’t grandstand. He spoke enthusiastically, but also with precision. You can easily imagine him hunkering down to the task on hand. His wife calls it “Sloan-ing." When he relocated his family to Boston for his MBA at MIT’s Sloan School of Management, he would often be in his own studious, mental capsule. However, life quickly changed after the MBA. 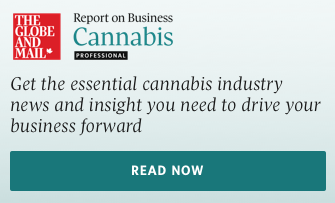 “[I] was maybe two weeks away from starting my new position, and my boss called me into his office and said, ‘Bob, you have to a decision here. Something’s come up,’" he said. “What came up was that Canada had joined as a partner in the International Space Station program. He said, ‘we think you’d be a good representative for Canada as the first long duration astronaut. So, you can either fly in space – or you can be a manager.’” Dr. Thirsk broke into a gentle laugh. “What would you like to do?” He laughed more, as he recalled the conversation. Now, in nominal, semi-retirement (“I want to say I’m retired, by my wife would be angry if I said that, because she knows that I’m still just as busy as I was before”), he continues to work for the Canadian Space Agency and with various non-profit organizations. And in some ways, he is now tying his disparate experiences together with things he previously had to ignore. “[Astronauts] all go through a solid education in science, technology, aviation or medicine. So, I really had to get the best education that I could, pursue excellence and sacrifice. And when I say sacrifice, some of my interests that I had when I was a child, I had to put aside – my interest in the social sciences and humanities and the arts,” he said. He now advocates not just for STEM learning (in the sciences, technology, engineering and math), but STEAM (an added "a" for the arts). “I’m a great believer in cross-disciplinary education, because that’s how the outside world functions,” he said, driving home the point that is already so clear from his résumé. Yet there is also a philosophical, rather than purely pragmatic, side to this view. “Some of the experience of space flight is not just professional. It’s also personal. I spent quite a bit of time looking out the window at Earth and thinking about my family, about me, about civilization, at the future of humanity,” he said. Thinking of that future, he mentioned in a public TED talk in Calgary, the view of the Nuu-chah-nulth First Nations on B.C. 's West Coast who adhered to a sense of oneness between the spiritual and physical worlds holding nature together. And on the phone, he saw oneness in the work of professors at MIT such as Peter Senge, who studied organic relationships within groups, an emphasis more on the interaction of people rather than focusing on the individual, and by extension an emphasis on the myriad people who have a hand in making an astronaut’s mission a success. For an outsider looking at all his experiences (and dreams), it can be hard to find an entry point. It can be difficult to separate the different elements of his life. I admitted this to him. So much of his learning and work is indeed cross-disciplinary. So much about putting an astronaut successfully into space is the accomplishment of many. How is it even possible to pick apart and study the effect that the MBA had on his life work? “That’s your job!” Dr. Thirsk replied with a laugh.